Marion Cecil Brownfield, age 82, passed away Friday, November 9, 2018. He was born on August 28, 1936 in Gay, Oklahoma to Homer and Elsie (Rush) Brownfield. He grew up around the Hugo area and attended Hugo High School. In 1954 joined the United States Air Force. In 1957 he married the love of his life, Betty Younce and they lived in Warrensburg, Missouri. 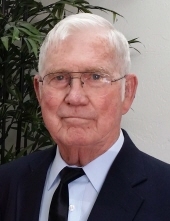 Cecil traveled the world serving the Air Force at various bases including South Korea, Thailand, Guam, and the Philippines eventually ending his military career at Dyess Air Force base in Abilene Texas in 1974. During his Air Force career they had 3 children, Debbie, Patty and Bill. After retiring from the Air Force they settled in his home state of Oklahoma where he drove a truck for Schrivner and later independently for himself. He sold real estate in the Mustang area to occupy his time. He also enjoyed woodworking and made several special pieces for friends and family. His passion was fishing and he loved to spend his free time doing so with his son, grandson and nephews. Together they found great joy seeking out all the amazing fishing spots in Oklahoma. Cecil was preceded in death by his parents Homer and Elsie (Rush) Brownfield; and two brothers, Everett and Coy. He is survived by his beloved wife Of 61 years, Betty of the home, Daughter Debbie Brownfield of Oklahoma City, Daughter Patty Mollohan and husband Greg of Mustang and Son William Brownfield and wife Michele of Dallas. Grandson Billy Brownfield of Dallas and 3 Step-grandchildren, Chris, Michael and Heather, with many step great grandchildren as well. He is also survived by sister Geneva Taylor and husband Bill of Paris Tx. Two brothers, Floyd Brownfield and wife Cleda of Paris Tx and Punchie Brownfield and wife Debbie of Sayer. Funeral Services will be at 2:00 pm Wednesday, November 14, 2018 at McNeil's Funeral Home at 525 W Highway 152 in Mustang, Ok with internment to follow at Mustang Cemetery in Mustang, Ok.
Online condolences may be made to www.mcneilsfuneral.com, we want this to be a celebration of his life so, please share with everyone your favorite story or remembrance of Cecil. Our dad was a true Veteran, he donated religiously to the Wounded Warriors Project. The family requests that in lieu of plants please make a donation to this charity. A donation box will be available when signing the guest book at the service for those who wish to do so. To send flowers or a remembrance gift to the family of Marion Cecil Brownfield, please visit our Tribute Store. "Email Address" would like to share the life celebration of Marion Cecil Brownfield. Click on the "link" to go to share a favorite memory or leave a condolence message for the family.